Look what I got! It is a Canon SX20. While it isn't a digital SLR, it is pretty much the next best thing. I picked this camera by Canon because it has an awesome optical zoom range (20x zoom), good megapixels (12.1mgpx) and a 2.5 in vari-angle display screen. Basically it means it takes awesome pictures and with the vari-angle display, you can take those ever-popular self or couple-portraits with ease! It is also really easy to just pick up, point and shoot. 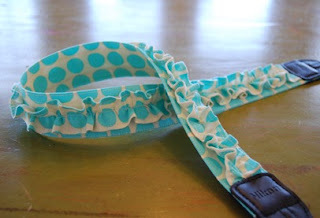 That is important for my husband who values ease-of-use over just about everything else. :) The next photo was taken by our lovely friend, Jalon. We had a fun dinner out tonight with friends. It was great! Image and tutorial from Crap I've Made. I Got a Blog Award! I received this award from Bekah at Bekah's Bytes. The rules for this award are rather simple. All I have to do is answer the following questions with a single word answer and then pass this along to five bloggers. Without further ado, my awardees (it is a word, I just made it one). As you can tell, I follow a lot of blogs and I love every single one! 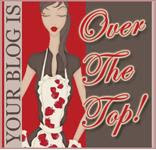 So I thought I would honor a few of the blogs that make my day. These are all blogs of friends and family who live far away, so thanks for keeping me up to date on your life! Collin and Candice Bullard - Thanks for keeping me up to date on life in the UK. Miss you! The Hageys - Thanks for being such amazing friends. I can't wait until we live closer! The Pattersons - I love you guys so much. Thanks for letting me be a long-distance auntie! 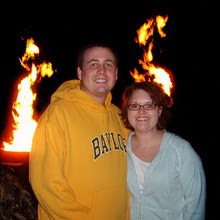 The Locketts - Every time I visit this blog I lament that we didn't get to know one another better while you were in Waco. Woods Life - Same goes to you, girl! I sure wish we would have spent more time together! Your blog is an inspiration. Answer the above questions on your blog and pass on this award to five blogs you are "digging" right now. I would love for each and every one of you to pass on the blog award and continue this "chain letter" phenomenon. So please know that if you do not continue the chain, one or more of the following things may happen. 3. Permanent loss of the ever-elusive "luck factor"
I don't make this up, people. The facts are the facts. 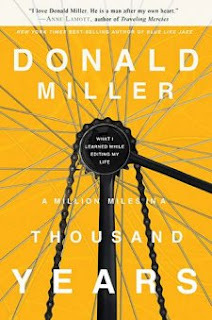 A Million Miles in a Thousand Years is the newest book release by author, Donald Miller. You may remember him for his book Blue Like Jazz. In his newest release, Miller invites us on his journey of self exploration and discovering the true meaning of living life well. Miller's journey begins as he is approached to help write a screenplay for the movie version of his book Blue Like Jazz. The book follows an episode in Miller's life and is entirely non-fiction --more of a memoir or Annie Dillard style musing. Miller decides he would like to help with the project and is confronted with the idea that he must rewrite parts of his story in order to make the movie a smooth journey. Simply put, his story--the one he lived and breathed--wasn't good enough to make a good movie. As Miller realized this and worked on the screenplay, he gradually learned the elements of a good story--and in the process he also learned what his own real life had been missing. Miller's book was wonderful. I love his style and his ability to mix true life changing concepts together with his twisted and hilarious sense of humor, wit and sarcasm. He is a breath of fresh air in a world of stale Christian non-fiction. If you are a fan of Annie Dillard or Kathleen Norris, you simply must check out Miller's books. Five out of five stars! Note for Full Disclosure: While I do not receive any monetary compensation for my book reviews, I am provided with free complimentary copies of each book. That being said, this review is completely my own, and free from the influence of Thomas Nelson Book Publishers. 1. Go back and stay at our honeymoon suite for at least 3 days and 3 nights...just because. 3. Have a Vitek's Gut Pak. 4. Workout at least 3 times a week for at least 3 months just to see how I feel. 6. Get involved in a women's bible study. 8. Move back to the Midwest. 10. See the Grand Canyon. 11. Go on a roadtrip or vacation with Sean and Theresa (and my sweet Belle!). 14. Read the entire Bible (kind of sad that I haven't done it yet...). 15. Read one book a week for a year. 17. Go on a vacation that doesn't involve "going home to visit family." 18. See a game in the new Yankee's Stadium. 19. See Wicked on Broadway. 20. Run a mile in under 10 minutes (this may not seem like a big goal to some of you, but...). 22. Bake a cheesecake (Sean, I may be calling for help on this one). 24. Grow something from a seed (once again, this may not seem hard to some of you...). 25. Write one note to a friend a week for a year. 26. Learn the basics of web design and upkeep. 27. Get up to watch the sunrise (at the risk of sounding like a broken record, this may not seem hard, but...). Primitives ~ Life ~ Art . . .